The sections below contain information on the Fire data types; including output attributes, quality and purpose of the data. Click on the pictures for links to the data. Landscape fires are amongst the Earth's largest terrestrial disturbance agent, affecting on average more than 3 million square km each year. There are very large regional variations in fire activity, for example in Africa most of the savannah grasslands actually burn every few years, whereas in the Boreal regions fire return intervals can be many decades long. Large interannual variations are associated with, for example, climate anomalies such as El Niño. As well as impacts on the land surface and on terrestrial ecosystems, fires release smoke containing multiple chemical species that have important implications for atmospheric chemistry, composition and climate. In fact, for some atmospheric species such as carbon monoxide and black carbon, biomass burning is amongst the largest contributor. 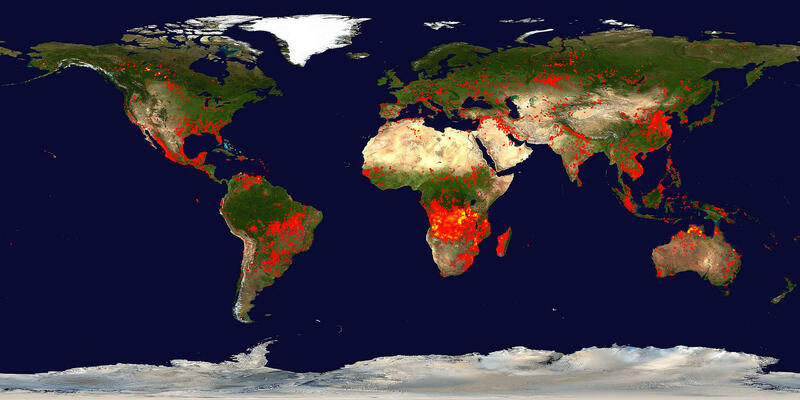 Satellite remote sensing is the only practical way to assess, quantify and monitor a rapidly changing global phenomena such as biomass burning. ATSR has bands in the shortwave, middle and longwave infra-red (IR) spectral regions that enable the nighttime detection of fires at the moment they are occurring by virtue of their very strong thermal emission signature, even if the fires only cover a very small fraction of the pixel. SLSTR has dedicated "fire" measurement channels that extend this capability to daytime observations, and which allow the assessment of the fires radiative power output (FRP) that is related to the combustion rate and rate of smoke emission to the atmosphere. For more information on ATSR fire data please contact martin.wooster@kcl.ac.uk.